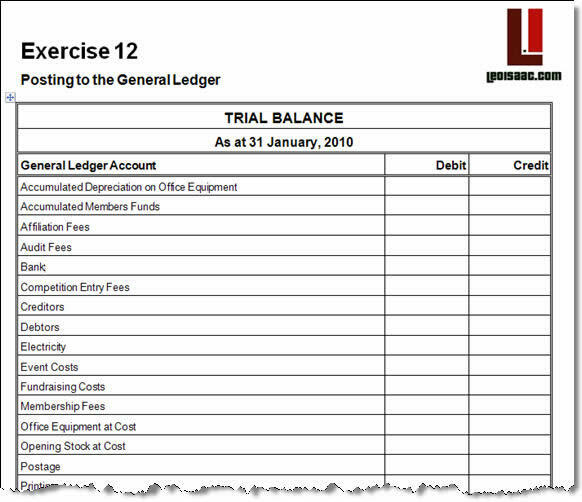 In this exercise you are given a completed Sales Journal and your task is to post all totals to the appropriate General Ledger Accounts and then prepare a Trial Balance. The General Ledger contains lines highlighted in yellow to guide you where you should post Journal totals. The Sales Journal Worksheet (PDF Format) that has been completed and totaled for the month. The General Ledger (Word Format) which is ready to receive your postings from the Sales Journal. Some screenshots of these documents appear below. You will need to post the totals of these columns to the appropriate accounts in the general ledger (which have been marked in yellow). Using your knowledge of the double-entry bookkeeping system, you will need to determine whether you post on the debit or the credit side of the ledger. Five of these postings will be on one side and one on the other side and this must keep the ledger in balance. It is up to you to use this clue wisely. If want to know the answer, see below.